Thank you for registering for The 18th Annual Novo Nordisk New Jersey Marathon Weekend. In an effort to make your participation more enjoyable, here is the eighth in the series of weekly messages. Copies of these updates are also available on our Website. Pre-Race: Carpool and be in the parking lots between 75-120 minutes early, or take the Special Race Day Train to the Start. Click here for a train ticket ($10). Pre-paid parking at Monmouth Park: We strongly suggest this pre-paid option. Click here for a pre-paid pass ($5). Pre-paid parking near the Finish Area: Guaranteed Parking for spectators at 7-President’s Oceanfront Park in Long Branch. Click here for a $15 pass. Post-Race – Getting to your vehicle: Take a regularly scheduled NJ Transit train, walk to a parking lot near the Finish Area, or take one of our free buses back to Monmouth Park. Race Day Gear Check: Take advantage of this free service for dry, warm, clothing after your race! Race Packet Pick-up: Free at the Expo. Paid service on race day morning. Click here to register ($25). Race Day Security Information for Athletes, Spectators, Press, Volunteers and Race Staff: Click here for special race day security requirements. Corral Loading Times: Half/Relay 6:10 to 6:40 am, Full 7:25 to 7:55 am. The last corral will remain open for loading until race start. If you forget the print out with your bib number, terminals will be available to look it up. It will slow down the process however, so we recommend you bring this printout with you. After you’ve completed your race be sure to stop by our Rejuvenation/Recovery Tent in the Finish Line Festival area for a free massage (watch for signs). A short message on tired and sore muscles, by trained experts, can do wonders on race day and the following days. You’ve earned it. Enjoy! Our 2014 Presentation line-up is bigger and better than ever before! The free presentations and demonstrations from experts in many fields will help you to excel, remain injury free, make the most of race day, recover better afterward and inspire you. Be sure to check the presentation schedule below while planning your time at the Expo and Packet Pick-up so that you can take advantage of this wealth of information. Open to the general public. 2014 Course Overviews – Jim Thomas, the NJ Marathon Course Director. Always one of our most popular presentations. 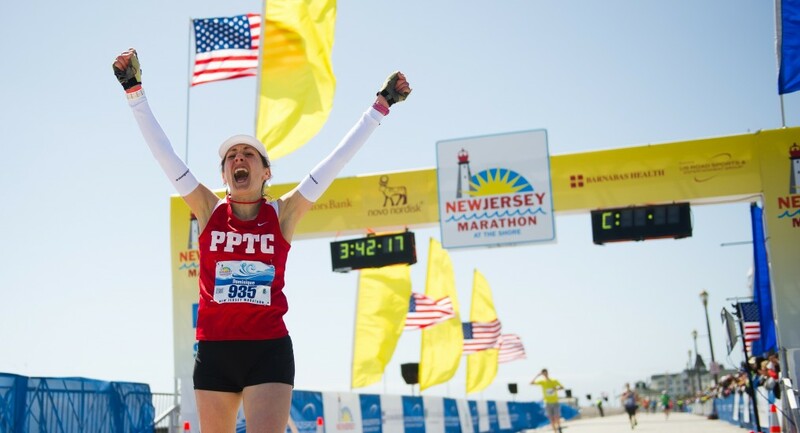 Race Pacing Strategy and the 2014 Pace Team – Otto Lam, the NJ Marathon Pace Team Director. Run with our Team. It’s free and super helpful! Proper Usage and Application of Taping – Christine M. Scarano, PT, DPT will be demonstrating on behalf of the Kinesio Taping Association. Christine will be offering taping services afterward. Course Overviews – Jim Thomas, the NJ Marathon Course Director. Always one of our most popular presentations. Proper Usage and Application of Taping – Christine M. Scarano, PT, DPT on behalf of the Kinesio Taping Association. Christine will be offering taping service for the race. Move for Hunger will be conducting a food drive again this year during the Health & Fitness Expo. Please remember, it’s “cans in hands” when heading to the Expo. Please help us to end hunger here in New Jersey!! We’re attempting to change the lives of families in African villages again by donating used athletic shoes to the MORE Foundation during the Expo. It takes the proceeds from 600 pairs of shoes to sustain a family for a year, and we’d like to adopt several families again this year! Together we supported 4 families in 2013. Thank you! I hope the information above will help you plan for the variety of activities available over the 3 day weekend. Best wishes during your training and throughout the entire weekend of activities! This entry was posted in Race Info and tagged Corral Assignments, Food Drive, Massage, Move for Hunger, Pitch In, Presentations, Presenters, Shoe Drive, Speakers, Used Shoes. Bookmark the permalink. Thanks for sharing nice thought. My pleasure Jill. Thanks for racing with us! Do you enjoy looking stylish? Are you always reading fashion magazines? Then, you are an expert in fashion. But even those who know a lot about fashion can easily find themselves in a rut with the fashion items they choose for themselves. This article will teach you, no matter how much or little you already know about fashion. Spot on with this write-up, I truly suppose this web site wants far more consideration. if you are looking for a media venture enterprises, first of all, you need to ask yourself, “why?” Why do you need the media? Are you really ready to see the media? Article can help you to achieve what? to share with you my success experience, want to give you more help entrepreneurs. As a serial entrepreneur, in ten years of in the past, I successfully created three companies, now in their respective fields and achieved good results, of course, also experienced a lot of lessons of failure. Very kind job, it’s helpful. I don鎶?even know how I ended up here, but I thought this post was good. I don’t know who you are but certainly you’re going to a famous blogger if you are not already 😉 Cheers! I鎶?impressed, I need to say. Really rarely do I encounter a blog that鎶?both educative and entertaining, and let me let you know, you’ve hit the nail on the head. Your concept is excellent; the problem is something that not sufficient people are speaking intelligently about. I’m very joyful that I stumbled throughout this in my search for something regarding this. Sin duda una noche ESPECIAL,llena de glamour, elegancia, moda, ideas, novedades, prendas originales y dise帽os exclusivos que consiguieron el 茅xito de la noche para todos los asistentes!! Isabella, tu colecci贸n es una aut茅ntica divinidad!!! para todos los gustos, ELEGANCIA Y MAGNETISMO. BSSS!! Exactly what severe plan work looking to accomplish over a capsule which you can’t perform at present? Make sure you keep in mind that whenever Dorrie Job opportunities unveiled the actual ipad tablet, it was shown as being a 3rd software choice (along having desktops as well as laptops). Anticipating some sort of tablet to perform SolidWorks design work is absolutely not exactly what the intended for. In that identical abnormal vein, what you might look at being non-serious job can be opposite great person (think salespeople). It can exactly about flow of work along with getting what realy works right for you.